This thesis looks at the prophetic tradition in the poetry of William Blake and Allen Ginsberg and the artistic kinship that Ginsberg felt toward the poet he considered his "guru." This thesis earned the President's Award for Undergraduate Research and the Humanities and Fine Arts Award for Outstanding Undergraduate Achievement from the State University of New York at Albany in 1988. Professor Don Byrd served as Advisor. Those familiar with William Blake and the prophetic tradition may wish to read the introduction and then skip to Chapter IV. Literature is art, an expression of the human mind, body, and soul, forged with skill, genius, and inspiration. When one comes upon holy literature -- art which is held sacred by some culture or group of people -- one finds that one's personal reaction to the art depends to a large extent on one's personal religious beliefs. The fundamental question the reader must ask is whether the text in question is holy to his or herself. The Old Testament of the Bible is accepted by a large percentage of Western civilization as holy -- as the Word of God. At the same time, in this age of science, Adam and Eve are largely seen as pure symbols, either of some ancient state of mankind in evolution, as psychological/mythical archetypes of the collective human mind, or as pure fictions, having little or no connection with either God or mankind in any real sense. It is one thing to read the first few books of the Bible as a symbolic representation of the creation of the universe and of the rise of man above the level of the animals, and against his brother. It is quite another thing to come across an interpretation of this text which accepts its events as literally true, then turns the entire scenario inside out. 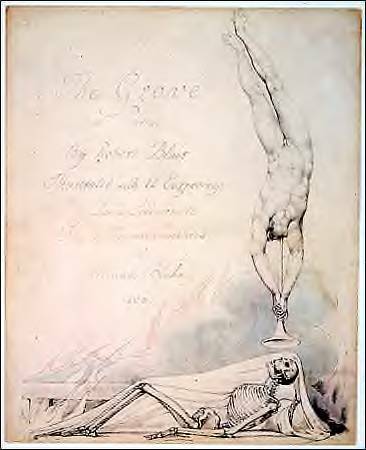 To William Blake, the birth of the universe is the same thing as man's fall, and is not the work of God, but of the satanic Urizen. This is a totally foreign interpretation from that which Western culture in its modern, loose way, embraces. Having what has been a basic, unchanging, and for the most part unexplored undercurrent of one's life and thought held up for scrutiny and possible destruction by some eccentric poet's ideas is a disturbing experience at best. In short, having never read the Bible, (neither an unusual nor horrid admission in this age) and then reading it, and reading Blake and Ginsberg, one's perceptions of one's life are put through the wringer. The question is whether they come out torn and shredded, or clean and purified. The desire in this essay is to leave such personal questions alone, and deal solely with the material at hand. Likewise, personal religious views will not be assumed. Our only assumption will be that there does exist something called inspiration, and that it is essential in the creation of art. We will use the term "prophet" for the sake of argument, to distinguish those who claim prophetic powers from those who make no such claims. This neutral stance has both its advantages and disadvantages. Neutrality of mind means neutrality, or at least silence, of heart, and this leads to a stale, safe discussion. On the other hand neutrality also means that we do not encumber the reader with religious convictions and philosophical ideas which the reader neither shares nor cares to hear. Also, and most importantly, we avoid the embarrassing pitfalls of cosmic gobbledygook. The use of the capitalized "God," then, does not imply belief or reverent awe, but rather is a representation of a specific conception of divinity: the entity which the conventional Judeo-Christian tradition refers to as God, the Creator; in other words, the monotheistic supreme being. There are other words which will be capitalized as well, such as "He", "Man", "Fall", "Creation", and "Eternity", with variations such as "Him", "Eternal Prophet" and "Universal Man". These are essentially Blake conventions, and a general rule of thumb is that the capitalized version of a word refers to its referent in a universal, or eternal context, as an eternal essence. The aim of this thesis is to trace the influence of the Old Testament prophetic tradition through Blake and Ginsberg's thought and poetry. The first section gives a brief outline of the Old Testament prophetic tradition. This section serves to introduce the terminology and the philosophical, religious, and cultural foundations of Western prophecy. We meet William Blake and his peculiar interpretations of Biblical events in the second section. Next, we will examine America: A Prophecy with an emphasis placed on its relationship to Blake's cosmogony and his stance as prophet. Section four introduces Allen Ginsberg in his twentieth century setting, and his relationship to Blake is discussed. The next section is an experiment of sorts, an examination of Ginsberg's America in terms of Blake's cosmological system and America: A Prophecy. The last section is a conclusion in name only. The lack of a firm philosophical or religious truth leads to chaos when one tries to justify statements about prophecy, and this inconclusiveness, if anything, is a conclusion. The imagination and institutions of our culture are permeated by the images, values, and morality of the Judeo-Christian tradition. The truth is, we are all trapped to some degree in our culture's religious heritage, despite our efforts toward a "world citizen" outlook or a "universal consciousness". Every American is to a greater or lesser degree familiar with and influenced by Biblical ideas and images, whether they are aware of it or not. If we as a culture see the world in Western terms, and as suggested, we are slaves to a Biblical mythology, even if subconsciously, then perhaps we are doomed (or blessed) with interpreting the universe in these terms, with seeing Divinity through the eyes of our "collective consciousness". The truth, then, may appear as a parable, and God as a man. For this is our fate, to be and see as human beings. I am also a musician....Here is some of my music.